it came home with me. pink tulips to enjoy as well. window this cold Sunday morning. Notice the snow moon over the cottage. is our Boathouse nestled in the snow. 100 km. winds.....sounds like a cozy storm day to me! Your new teacup and tray set match that gorgeous teapot perfectly, Carolyn! WOW- what a treasure to find! Yay! It's the weirdest weather - never know what to expect these days. Last week I went into choir practice with no coat on, and came out to 3 inches of snow on the ground! And it didn't stop snowing all night and all the next day....and today it's all gone. One sure way to know you are going to have bad weather is that pink sky in your morning pictures......Red sky at night, sailor's delight, red sky at morn, sailors take warn! Stay inside sippin' and dreaming of Aiken House gardens and drool over some new garden magazines is the order of the day! 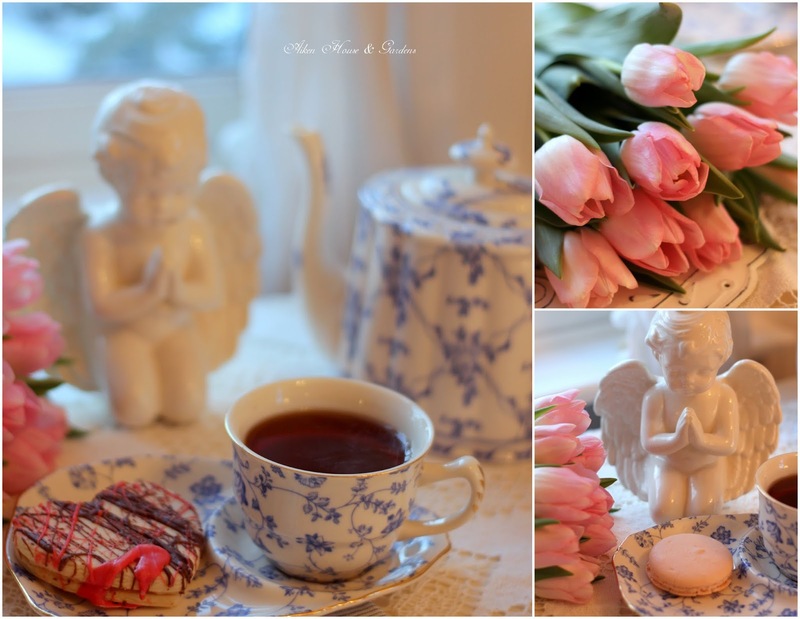 Such a lovely post and the teacup and tray set is beautiful. Wish I was going to be there sharing a cup of tea and watching the snow pile up. Here in Kentucky we've had such a mild winter there's been only a dusting of snow. Just want you to know how much I look forward to your posts. They always leave me feeling I've had a restful visit to your wonderful home. Bright blessings to you.